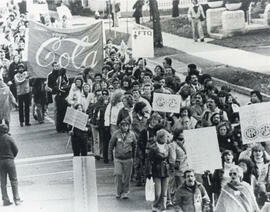 The photograph shows ca. 105 delegates of the convention posing for a photograh in a parking lot. An unidentified brick building, Esso gas station sign and a Ford dealership sign are in the background. Item is a photographic still from video Selling Out. Image is of Public Service Alliance of Canada rally in Ottawa, Canada. Item is a photographic still from video Selling Out. 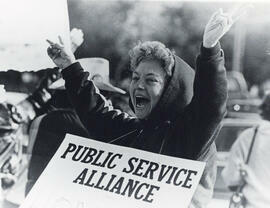 Image is of a person demonstrating at a Public Service Alliance rally. Item is a photographic still from video Selling Out. 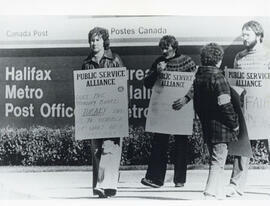 Image shows Public Service Alliance of Canada clerical staff picketing at the Halifax Post office. 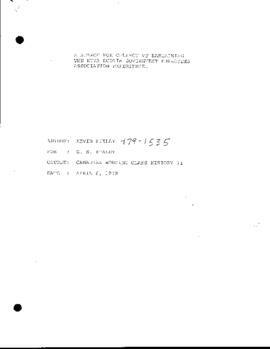 File contains a copy of Ian McKay's paper titled Strikes in the Maritimes, 1901-1914. The paper was delivered in the North American History Seminar coordinated by Bruce Tucker. The majority of photographs are labelled on the back with names, date year, and the location.